Layer appearance can be adjusted in Layer Properties. Double click on the layer to open Layer Properties. Click on the colored square. In Style tab, it is possible to set visual settings: colors, symbology, line width, hatch patterns. The color can be chosen using a color diagram or by inserting HEX color code. 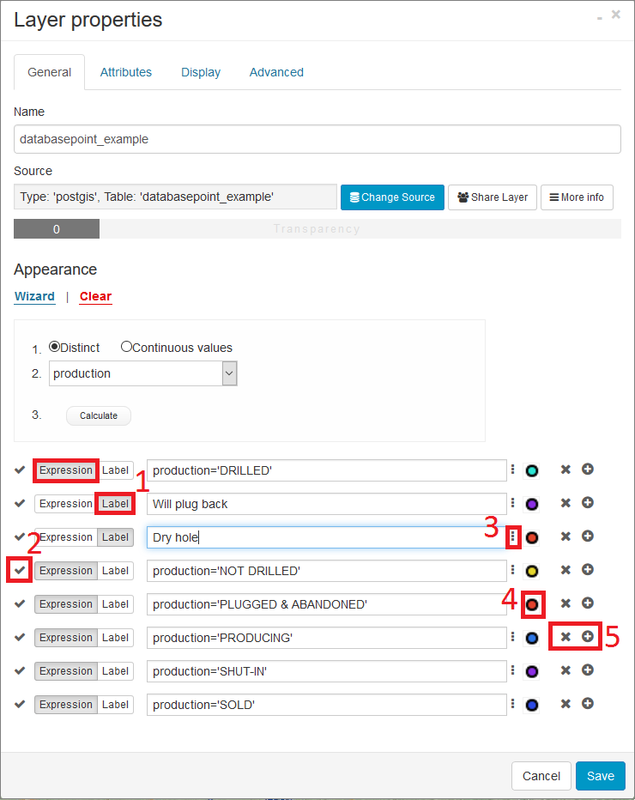 For the point layers, it is possible to add predefined symbols, upload existing symbols or create a custom symbol. 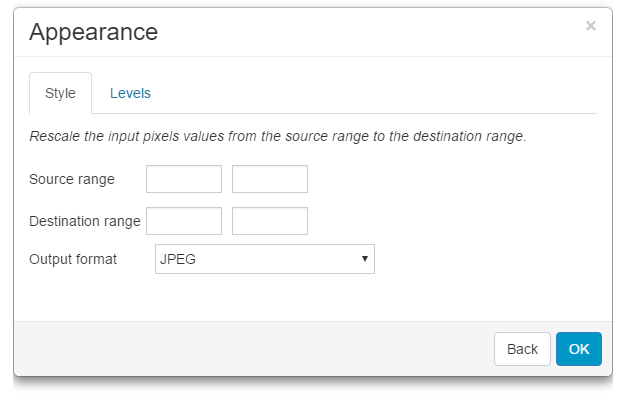 Uploaded symbols can’t be resized in the cloud, so we suggest using icons with size from 30 to 50 pixels. Browse – find a symbol uploaded in File System. Custom – set a custom symbol. 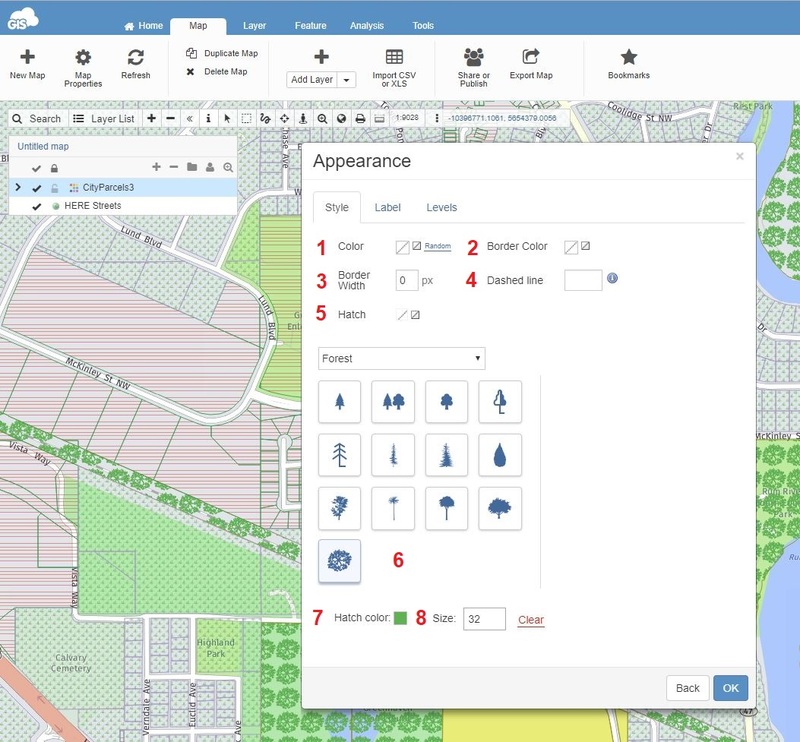 Overlap – depending on the overlap, the level different number of the symbols will be displayed on the certain zoom level. Avoid symbol overlapping is the fastest method. Show all symbols but it may affect performance. Clustering – system groups a densely points into the one point, depending of the zoom level. 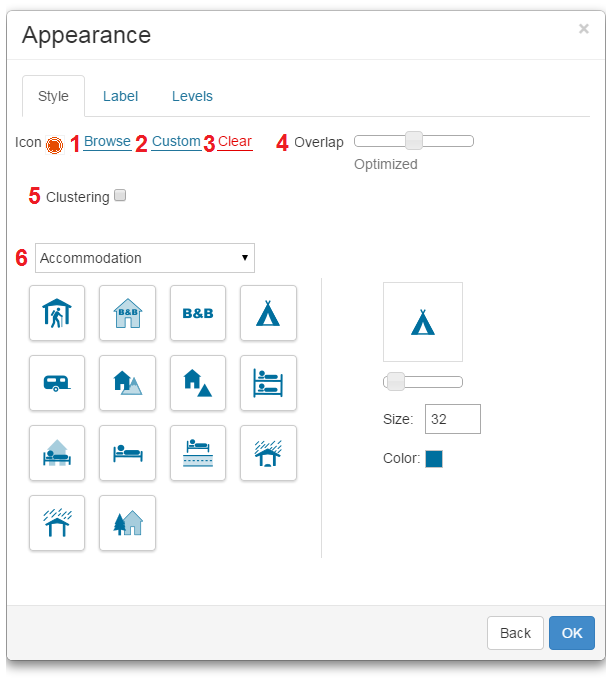 Predefined icons select from the dropdown menu predefined icons, their size, and color. Dashed line – specify the dash setting. It takes an array of numbers. Numbers are specifying the sequence of dash/space/dash/space etc. When finished the sequence repeats itself to the end of the line. Dashed line set to 5 – a basic setting that will result in a dashed line where both the dashes and spaces are 5 pixels in size. Dashed line set to 1,2 – a setting that will result in a dotted line where the dashes are 1 pixel in size and the spaces are 2 pixels. Dashed line set to 2,3 – another dashed line but with small dashes. Dashed line set to 5,5,2,2 – a setting where the first dash is five pixels, then a space of five pixels, then a dash of two pixels, then a space of two pixels, then the sequence starts again. For polygon layers it is possible to adjust inner color, border color, border width, dashed line for the border and hatch. Hatch pattern can be taken from one of the available predefined symbols or it can be uploaded to File manager as jpg. or .png file. The optimal size for icons uploaded for hatch pattern is around 50×50 pixels. Size – define the size of the predefined symbol which will populate the field. Note that manualy uploaded hatch icons can’t be resized. In Style tab for raster layers it is possible to rescale the input pixels from the source range to the destination range. Each raster has an input range of colors. The range has values between 0 and 255 where each value represents one color. It is possible to change the range of colors in the raster by changing the values in the destination range. 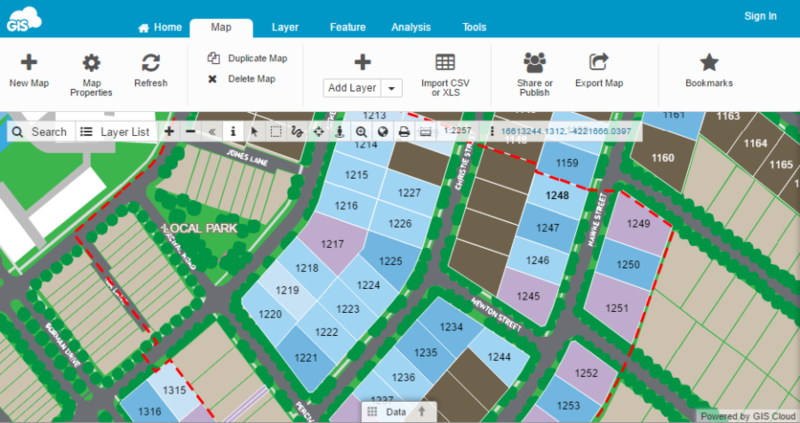 It is also possible to change the output format for the raster on the map. This option is usually used when the black edges in rasters are removed. Click here for detailed instructions. Permanent labels are always visible on the map. 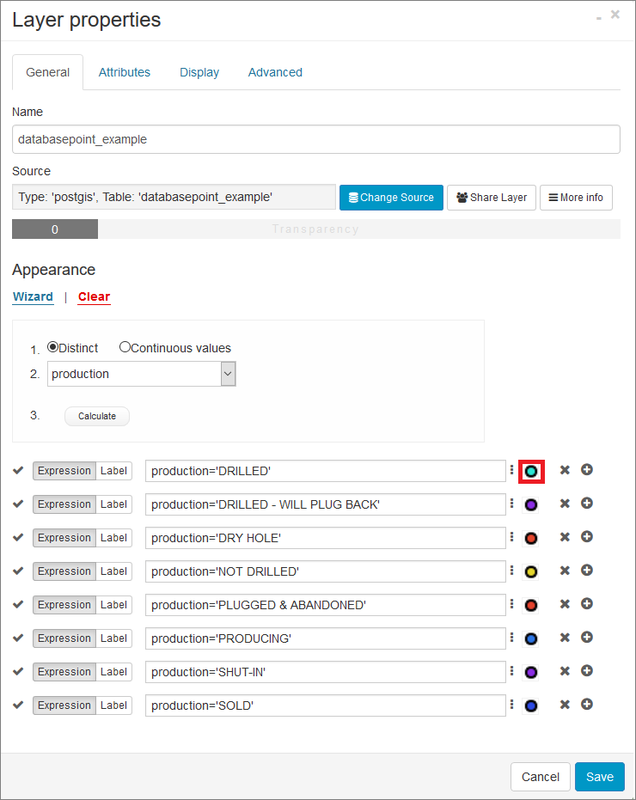 Label displays feature’s attribute data. It is possible to adjust position, fonts, colors, and placement. Labels are scaled depending on the zoom level depending on the density of the features. 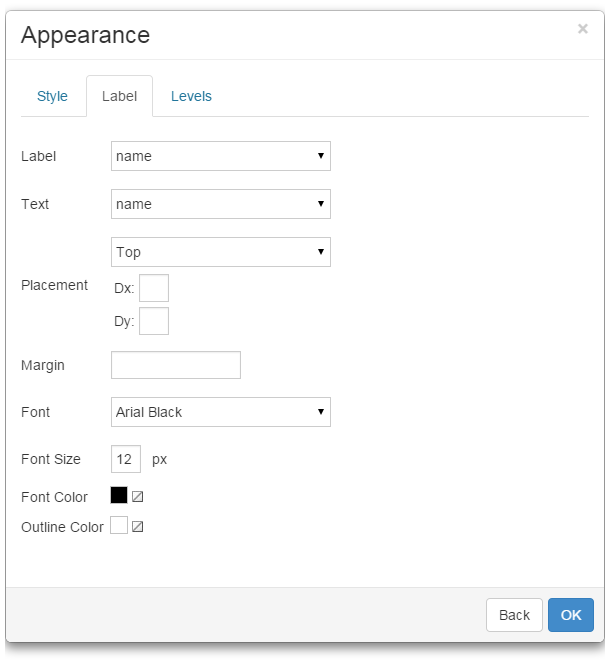 Under the Label dropdown select a column you want to display as a label. Optionally set Placement, Margin, Font, Font Size and Color and Outline Color. Placement – defines the position of the label in relation to the feature’s geometry. Dx and dy define offset in pixels: dx – left and right, dy – up and down. Margin – defines offset between labels in pixels. Color – defines the fill color of the label. Outline Color defines the outline color of the label. 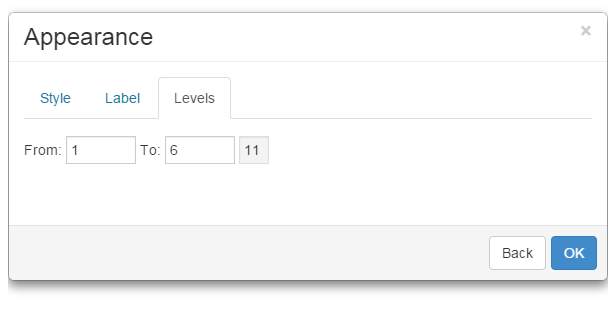 Note: For a line layer from the Text dropdown select a column you want to display as a label. It is possible to set a range when the geometry will be visible. Current zoom level is written in the box on the right side. 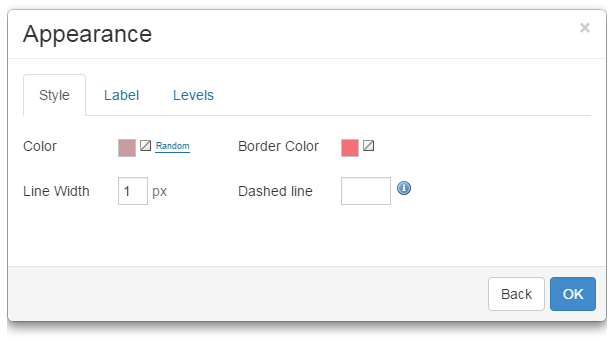 You can manually set a expression or add a label which will be displayed in the Layer List. Hold the mouse button to drag the expression to a different position. Select Appearance to change the defined color.